My mother in law lives in Sonoma County, California and they have Single-Stream Recycling carts. This means that all recyclables go into one cart, all green waste goes into another cart and all trash into a third cart. That's it. No sorting glass from everything else, no selecting only certain types of plastic, no bundling paper and corrugated cardboard. Sonoma County's waste diversion (recycling) rate is over 60%. Take these two counties with two different recycling systems. The county with a complex recycling system (see the official brochure for how-to recycle guidelines) has a 9+% recycling rate (which is low for New Mexico). The county with single-stream recycling has 60+% recycling rate. I know there are other differences between these two counties, yet there are enough similarities for this comparison. 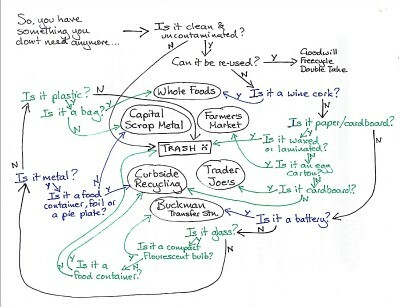 My next question: Why is recycling in Santa Fe so complicated?